UPDATE 11/29: If you missed out on the Black Friday or Cyber Monday BarkBox deals, don’t worry! Get a FREE extra month added to any Classic BarkBox plan of 1 month or longer when you use this link along with BarkBox code: WOOFWOOFMAMA at checkout. Wondering what to get your favorite fur kid this Christmas? You can’t go wrong with a BarkBox of dog toys, treats and surprises customized especially for your dog’s size. BarkBox is the most popular dog subscription box service for a reason and right now you can get your dog’s first BarkBox for only $5! Just choose either the Classic or Super Chewer edition and select a 6 or 12 month subscription using one of the links below. Offers end 11/28. Get your first Classic BarkBox for $5 with the purchase of a 6 or 12 month subscription! Use THIS link if you want this offer. If your dog is an extreme chewer or toy destroyer, you can USE THIS LINK and get your first Super Chewer BarkBox for $5 with purchase of a 6 or 12 month subscription. Daisy has been getting BarkBox for several years now and we are always amazed & surprised at the variety of original new toys, treats and goodies that are in each box. BarkBox offers a full satisfaction guarantee, free shipping and excellent customer service, so this gift is a win-win for both pet parents and canine companions alike. 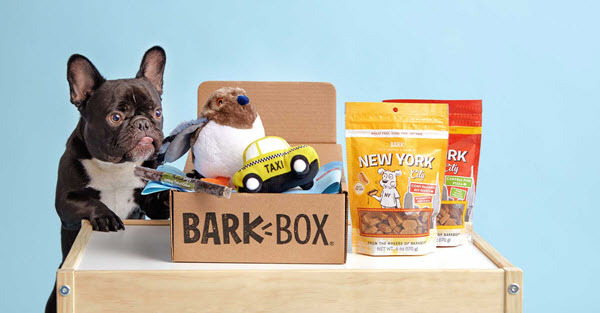 To learn more about the different BarkBox subscription box options for dogs, check out all our previous BarkBox Classic and Super Chewer Reviews HERE.